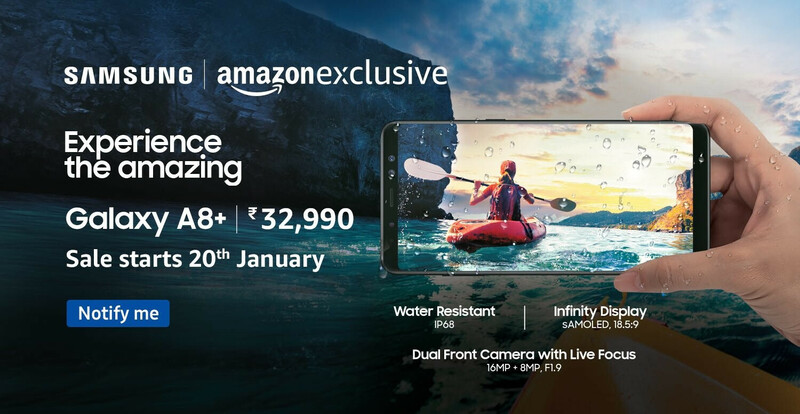 Last week, we told you that the Samsung Galaxy A8+ (2018) will be an Amazon exclusive in India when it is released this month. This morning, Samsung unveiled the device, revealing that it will go on sale in the world's second largest smartphone market on January 20th priced at Rs. 32,990 ($518 USD at current exchange rates). Featuring the Infinity Display used on the Samsung Galaxy S8, Samsung Galaxy S8+ and Samsung Galaxy Note 8, Indian consumers can buy a phone that looks like an expensive top shelf model, for a mid-range price. The Samsung Galaxy A8+ (2018) carries a 6-inch Super AMOLED display with a resolution of 1080 x 2220, and an aspect ratio of 18:5:9. Some home cookin' is under the hood in the form of the Exynos 7885 chipset, featuring an octa-core CPU clocked at 2.2GHz, and the Mali-G71 GPU. 6GB of RAM is inside along with 64GB of expandable storage. On back is a 16MP camera with an aperture of f/1.7. There is a dual camera setup in front, weighing in at 16MP and 8MP. A 3500mAh battery keeps the lights on, and Android Nougat is pre-installed. The Galaxy A8+ (2018) has an IP68 certification rating, is equipped with Bixby, and supports Samsung Pay. Click on the sourcelink and you can sign up with Amazon to receive an alert when the phone is available to be purchased. Since the A8+ has 6 GB of RAM, there's almost no way the regular S9 will have 4 like some of the rumors have suggested. Not that 4 isn't enough, but it would be a huge fail on Samsung's part to have an upper mid range device with more RAM than their flagship. C9 Pro had 6GB RAM in 2016. S8 had 4GB in 17’. Samsung has done this before and might fail us again. Nothing surprising for me. Interesting. I'm not familiar with that phone. I guess the precedent has already been set that being the case. Samsung’s C series phones are meant for China, where big sale numbers are usually scored with big hardware numbers. That might be one of the reasons why the C9 Pro had 6GB while the S8 didn’t. But that shouldn’t be an excuse to exclude better things from your flagship device. If samsung's C series is meant for China. Then how Galaxy C series is available in India?? I didn’t say it was exclusively available in China. But rather that it’s developed with chinese customers in mind, more so than others (apparently). That was for Chinese market. It may be 6 ddr3 against 4 ddr4. Could you please change Jamuary to January? lol for some reason i actually prefer Jamuary. Buying this thing over Oneplus 5T(which gives you flagship level features) at this price is pretty stupid. And if you hate those Chinese OEM’s than just go for LG G6(which is in same price range) or else wait for the price drop.